1Center for Health Policy, Law, and Management and Department of Economics, Box 90253, Duke University, Durham, North Carolina, 27708, USA. 2Department of Economics, Box 90097, Duke University, Durham, North Carolina, 27708, USA. 3Department of Medicine, Box 3921, Duke University Medical Center, Durham, North Carolina, 27710, USA. 4Department of Ophthalmology, Box 3802, Duke University Medical Center, Durham, North Carolina, 27710, USA. 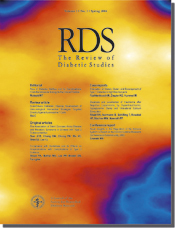 OBJECTIVES: To study the discrepancy between actual and recommended rates of use among several measures of screening for complications of diabetes in a national longitudinal sample, the correlations among measures of adherence, and whether or not higher rates of adherence reduce hospitalizations for complications of diabetes. The key study hypothesis was that lack of adherence to professional recommendations for diabetes care leads to adverse health outcomes for elderly persons. METHODS: Administrative claims and survey data for 1994-­1999 on a nationally representative sample of Medicare beneficiaries age 65+. Principal components analysis and instrumental variables probit regression methods were used. RESULTS: Most Medicare beneficiaries diagnosed with type 2 diabetes had at least one physician visit per year, but rates of screening (eye examinations and HbA1c, lipid, microalbumin and urine tests) fell far short of recommendations. Correlations among use rates for various types of screening were positive but far less than one, suggesting that failure to screen reflects a complex set of underlying factors. Increased rates of adherence were observed for HbA1c and lipid testing over the observation period. Higher use was associated with lower rates of hospitalization for complications of diabetes (vascular (p=0.007), renal (p=0.002), and other complication (p=0.005)). CONCLUSIONS: Adherence to guidelines was associated with significantly reduced rates of hospitalization. Continued analysis of the trends in clinical practice is needed to demonstrate the effectiveness of standardized guidelines for the care of patients with diabetes.